Good news. We are in the midst of an intelligent debate about the European discovery of New Zealand and Australia. The glass is cracking around the negative stigma that has surrounded the theories on the Portuguese and Spanish discovery of Australia and New Zealand for the past 30 years. These theories appear to be moving from being presented as fringe ideas to being discussed in the mainstream as real possibilities. Because of you – society – it is changing. People are information and knowledge hungry – you want to know the arguments for and against a topic and make up your own mind – as opposed to being told ‘this is what happened or this is what you should believe,’ or in academic circles, not having the discussion around the theories at all for fear of being criticised. Some examples from these venerable historians. Similarly, the late Dr Helen Wallis, United Kingdom based and the president of every cartography organisation imaginable, and who reviewed in detail the sixteenth century maps that are purported to indicate a discovery voyage of Australia and New Zealand, wrote, “The answer to the enigma may be regarded as non-proven, but with the balance of evidence in favour of a Portuguese discovery of Australia,” (1988). What the likes of Hocken and McNab and Wallis indicate, and they are just examples, is that across multiple generations people have reviewed some of the evidence of Portuguese or Spanish exploration to New Zealand and Australia – the likes of the sixteenth century Dieppe Maps – and seen the same thing and drawn the same conclusion – that being that the Portuguese probably discovered Australia and New Zealand, and the Spanish may have also voyaged to New Zealand pre-Tasman. And there are plenty more examples from some of the top writers of their generation. In 2016, it appears that their work is finally coming to the fore. Where have we got to in 2016? Three government institutions in three different countries (New Zealand, Spain and Portugal) now consider the Portuguese and Spanish theories a possibility, and some a probability, following a review of the evidence presented in Conquistador Puzzle Trail, which presents both the excellent work completed by historians over the past two centuries and new original research. Pablo Mateu García, Educational Advisor of the Embassy of Spain, New Zealand. Paulo Cunha Alves, Ambassador of Portugal to Australia and New Zealand. 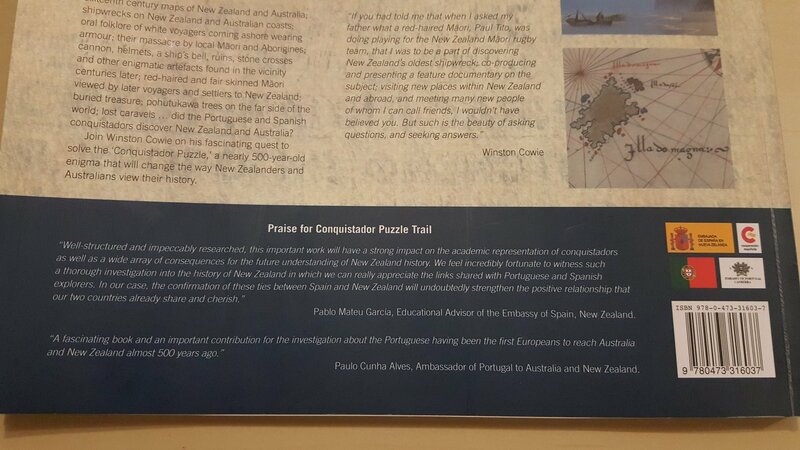 Both the Spanish and Portuguese embassies to Australia and New Zealand also kindly gave permission for their logos to be included on Conquistador Puzzle Trail as a sign of the cooperation and collaboration shared whilst researching and writing. 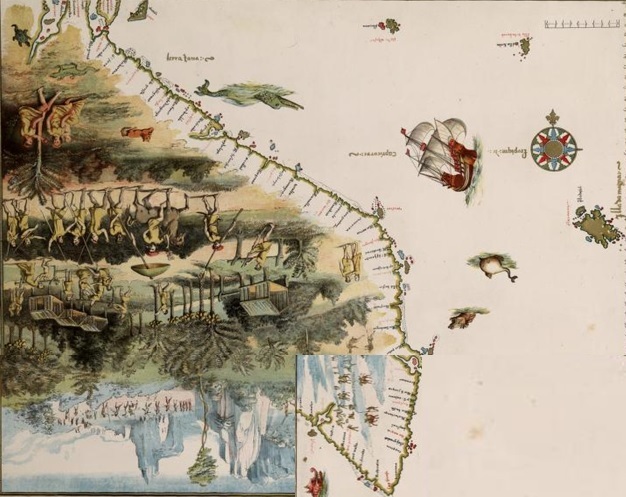 Following the addition by Te Ara of Conquistador Puzzle Trail to the national encyclopedia’s references, in 2016 the Portuguese and Spanish discovery debate became a topic of discussion at the national level. Following the recent forward-thinking initiative of Te Ara, the first recent nationwide article in the debate appeared, good news, although the presentation of the news was presented as a negative – with comments that were described as ‘rubbishing’ the Spanish and Portuguese theories dominating the national headline. That article and those comments can be found here. 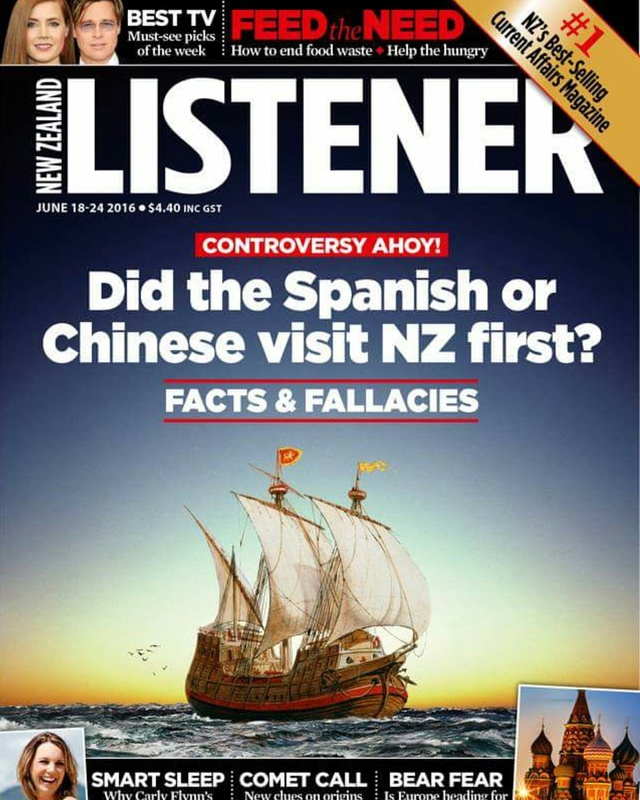 My response to that article entitled ‘About that rubbish: The Portuguese and Spanish voyaged to New Zealand Pre Tasman,’ is located here, and provides a case study as to how the conversation in the media in respect of the theory has played out over the last 30 years. The conclusion – society deserves better than the dismissive rhetoric that it has been served up on this subject for the past 30 years. It is no longer relevant. What is required is intelligent and respectful debate in order to move knowledge forward. It is an intelligently written article by Matthew Wright, a New Zealand historian and fellow of the Royal Historical Society, and as per the approach of the various government institutions, it well and truly brings the Portuguese and Spanish European discovery of New Zealand and Australia out of the shadows and into the plausible. On this genre, it considers the Spanish Juan Fernandez discovery theory (1576-78), the Portuguese Christopher Mendonca theory (1522-24), the wreck of the fabled lost Spanish caravel, the San Lesmes theory (1527) and puts forward Wright’s view on them. What a breath of fresh air to have those theories debated in New Zealand’s on point current affairs magazine and have a well-respected historian put forward his views on them. And in this case study, the paradigm shift does exactly that and reflect international thinking – Spain and Portugal. I am also working on engaging with the relevant institution in Australia. And so back to the debate – the interesting part. 4) Where the Portuguese and Spanish theories should sit in Australian and New Zealand discovery theory. The purpose in drawing these points to your attention, is to assist you in forming a view on the subject either way. In my open letter to the Ministry of Culture and Heritage entitled: ‘Open letter to the New Zealand Ministry for Culture and Heritage re European discovery of New Zealand,’ dated October 2015. Click here. In my article, ‘About that ‘rubbish’. Yeah Nah. The Portuguese or Spanish probably voyaged to New Zealand pre Tasman, dated May 2016. Click here. In the recent article in the Northern Advocate, entitled: Conquistador Trail From Portugal to Pouto, dated August 2015. Click here. My issue with the statement is that it uses definitive language and directs the reader that they need to do something or think in a certain way – i.e. in this case interpret maps in a certain way. 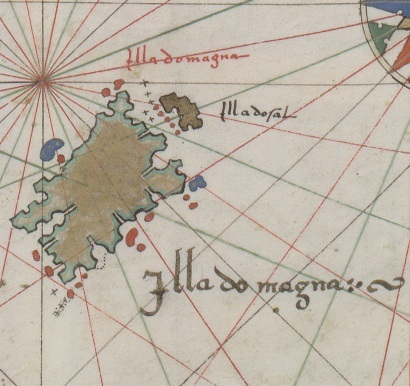 I would like to politely suggest that the reader compare those sixteenth century maps to the modern coastline of Australia and New Zealand, and be aware that in some places what the Portuguese names state on the map are descriptive of the very things that define those places geographically today. As an example of some of the 120 Portuguese place names that appear on the most detailed map (from 1547), at Fraser Island in Australia where there are pumice deposits, the word pomezita (pumice) is written; similarly where the word camronron appears, which means prawns, there is a modern day prawn fishery today. Where the Great Barrier Reef is: Costa Dangeroza – Dangerous Coast. The list goes on. 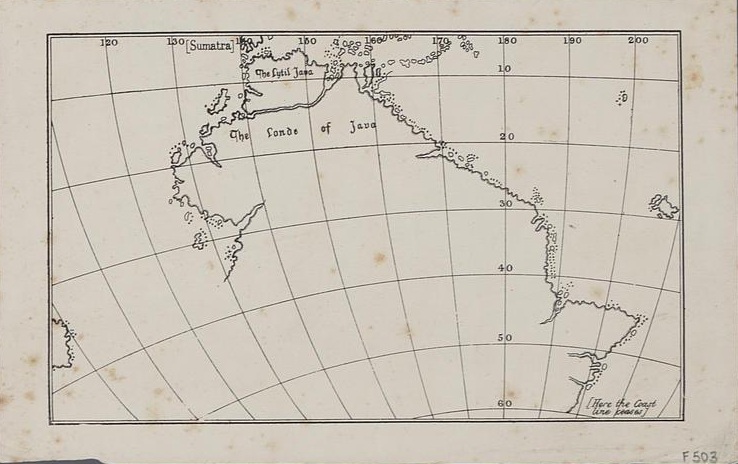 The coastline of the continent is also similar to that of Australia and New Zealand – not in all places sure, but taken as a whole and to use Wright’s words the ‘context’ of cartography at the time (the context of which includes details on Jean Rotz who was considered a cartographer who never ventured into speculative cosmology) – on the basis of these maps alone, the serious and very tenable theory can be made, that the Portuguese discovered Australia and New Zealand. As a footnote, I would like to point out that only one of the Dieppe Maps appeared in the article, and that wasn’t in the global terra incognita australis context (i.e. in the context of what was considered known of the globe at the time) that Wright suggests. I include this context below. Jean Rotz Circular Chart – 1542. The global context – Rotz was not known to deviate into speculative cosmography. Vallard Map 1547 The North island of New Zealand? In summary on this point in the debate, we can agree to disagree on the relevance or otherwise of the maps to Australian and New Zealand discovery theory. We are only two – and in New Zealand there are over 4 million others that may sway the argument either way. This statement is not true. There is no discussion in the literature in the 1880s of a Spanish voyage by Juan Fernandez to New Zealand. The theory wasn’t made until 1918 – nearly 40 years after this. In respect of the Spanish government ‘ascribing a discovery’ because they were ‘allured to’, again there is no evidence at all of this – the theory was first made by a Chilean historian Jose Medina in 1918, in a little known book entitled: The navigator Juan Fernandez. When Medina’s theory did become more well known, the Spanish government embraced the theory, and indeed on the wall of the Madrid Naval Museum, is a wall mosaic celebrating Spanish exploratory voyages, and the route of Fernandez appears. Conquistador Puzzle Trail provides further details. The third point I would like to raise in the debate is Wright’s statement in respect of the fabled lost caravel the San Lesmes. For those interested in Pacific discovery history, please read the late Robert Langdon’s The Lost Caravel (1975) and The Lost Caravel Re-explored (1988) – a brilliant review of early Pacific voyaging and which contains Langdon’s San Lesmes theory. The issue with this statement is that neither Langdon or Herve state that the San Lesmes reached New Zealand or Australia before then being wrecked at Amanu in the Tuamotu archipelago. Langdon’s theory is that the San Lesmes hit the reef at Amanu before voyaging to Tahiti then New Zealand, where he theorises it was wrecked at Kawhia, not at Amanu (which is in the middle of the Pacific). Conquistador Puzzle Trail takes Langdon’s theory further discussing the possibility of the San Lesmes not being wrecked at Kawhia, but further north at Baylys Beach, Dargaville. 4) The conclusion as to where the Portuguese and Spanish theories should sit in Australian and New Zealand discovery theory. “In the end the issue is academic. A proven pre-Tasman Iberian visit is unlikely to disturb our wider sense of place. History, as a way of understanding our human journey from past to present, is about wider trends. In that sense, even a demonstrable Spanish or Portuguese visit would be no more significant for our history than Tasman’s brush past our shores in 1642. That was the first time we can be sure that Europe found New Zealand. 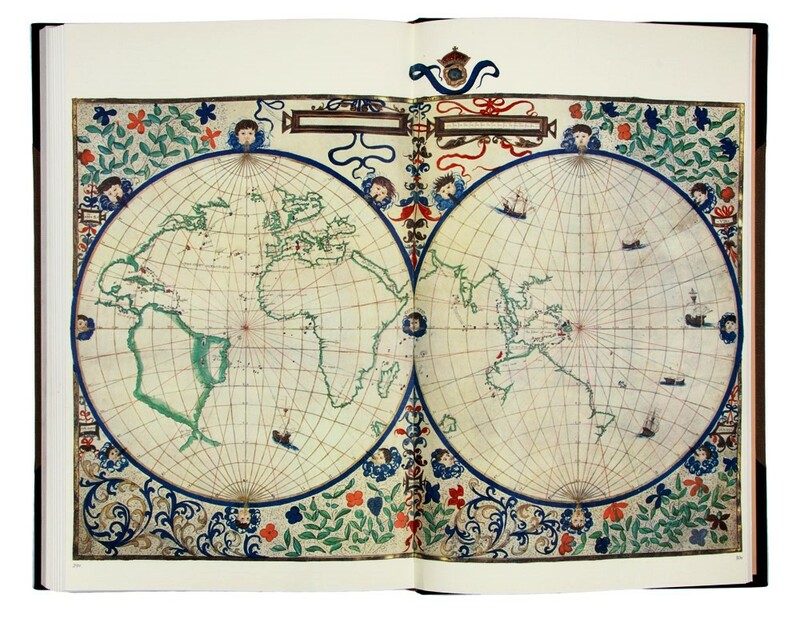 And that visit gave us our name – Nieuw Zeeland, probably chosen by Dutch cartographer Johannes Blaeu. But the first significant European impact on Maori did not come until the arrival of British ne’er-do-wells, convicts, whalers, sealers and traders, broadly around the beginning of the 19th century. They brought the products of Britain’s industrial revolution – and the detritus of a British society in flux – into collision with traditional Maori life. So began a cascade of events that led to the colonisation of New Zealand by Britain – and, eventually, to New Zealand as it is today. I would like to contest the ‘significance’ comment – which, as with the Dieppe Maps comments above, is written definitively. The comment basically says – even if the Spanish or Portuguese voyages occurred, they wouldn’t be significant. Significance is different for individuals, localities, countries. If one of the theories was proven, on the contrary, it may be very significant to the Spanish and Portuguese governments – a source of pride – as I am sure Tasman’s voyage is to the Netherlands. Similarly, I also imagine that those hardy sailors who made those early maritime voyages, and who suffered scurvy, hunger and disease, would hope that they were more than a ‘footnote,’ in history. On the significance of the theories, let’s see….It’s up to society to decide whether or not the theories are significant or otherwise. On the Portuguese and Spanish discovery question, there are more questions to be answered, more research to be explored more widely – there just needs to be the interest from society, students and teachers. On this point, Dr Ross Ramsay, a lecturer at the Southern Institute of Technology, has taken the initiative and is seeking his student’s views on the subject. Is there another history teacher in New Zealand or Australia who would like to review Conquistador Puzzle Trail and perhaps teach it as a unit of work in school or university? The first history teacher to get in touch and volunteer for the review, I will send you a free copy. Finally, the myth that there is nothing to the theory in respect of the Portuguese and Spanish voyaging to Australia and New Zealand appears to be cracking. Did the Spanish and Portuguese voyage to New Zealand and Australia pre Tasman? And if they did, what is the significance? We can have a mainstream conversation. Once again, thank you to the New Zealand Listener for being ever relevant and on point in publishing on this subject. This entry was posted in Uncategorized and tagged Christopher Mendonca, Conquistador Puzzle Trail, European discovery of New Zealand, New Zealand author, New Zealand authors, Portuguese discovered Australia, Portuguese discovered New Zealand, Pre Tasman explorers, Spanish discovered New Zealand, Spanish voyaged to New Zealand, Winston Cowie, Winston Cowie Author by wcowie. Bookmark the permalink.